A blog for games, rules, tools and variants for a variety of nerdly things. In the world of Munchkin RPG, you play the role of a haphazard adventurer who doesn’t know much about much. Somehow you got hired by the king to empty out a nearby dungeon of the great evil that lies within. Your reward? As much treasure as you can carry out of the dungeon and equal its weight from the royal treasure room. Maybe also the princess if you’re lucky. Or a prince if you like that instead. You’re handed a backpack full of random weapons, armors, potions, spells, traps, monster eggs, and race-altering mixtures and shoved out the door. Luckily there is a merchant who has made camp right outside the dungeon entrance. He’ll gladly trade with you and your friends. Wait… friends? You didn’t think you were the only one hired did you? The king doesn’t care who emerges victorious, so long as the dungeon is empty by the time one of you leaves it. Venture forth, young Munchkin and claim victory and treasure as your own! The goal of Munchkin RPG is simple. Defeat the horrible dungeon boss. Give yourself stats. Choose a High stat and a Medium stat and a Low stat. A player’s High stat grants them the High bonus and the Medium bonus. A player’s Medium Stat grants the Medium bonus and a players Low stat incurs the Low penalty. Each player’s High stat also gives them a special ability usable once per life. If the player dies, they are allowed to use their special ability again. Additionally, players are allowed to sort through the deck to pick a Race before the game begins. Players may not pick a Class in this manner. They will have to find one as normal. *Details for each stat effect are listed in Glossary/Help. Players should use some sort of marker to indicate their stats, so they can not be forgotten mid-game. however, players are allowed to change their stats in the middle of the game, so make sure it is something alterable. Both decks (door and treasure) are shuffled separately. Then players construct decks out of the available cards. Decks must contain at least 12 cards minimum from either type of card (door or treasure) and must have exactly 40 cards. The players do not get to look at the cards before choosing them. The players choose how many of door and treasure cards they would like, then they receive that many of each at random. Extra cards will make up the dungeon and the store inventory. There is still a community door deck which players draw from, but there is no loot the room option. Players use the door deck to fight monsters or become cursed. 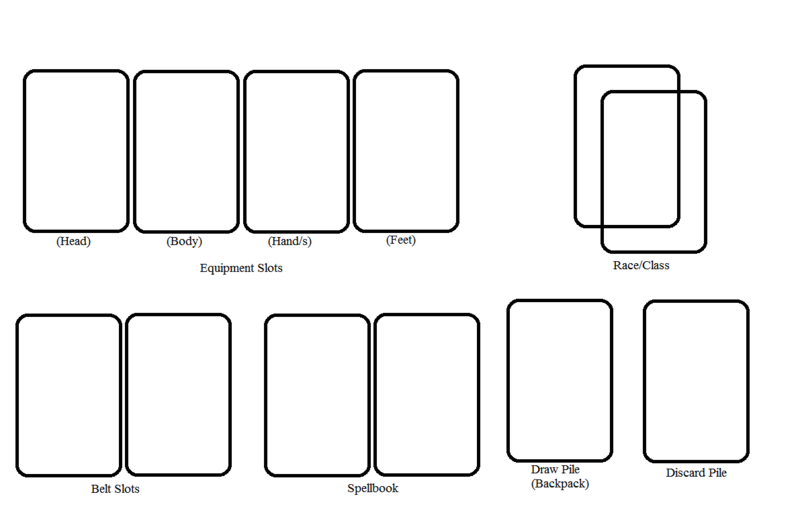 Players each have a draw pile (backpack), a discard pile, equipment slots, a belt (for grenades) and a spellbook (for curses and traps) and a spot for their race and class, as shown below. Take the remaining treasure cards and deal out 6 random treasure cards and place them all face up in a line in the middle of the play area. This makes up what the store currently has on sale. The rest of the treasure cards are placed next to the stock for the remainder of the store’s inventory. The top cards of the door deck are revealed until 6 monsters are revealed. These cards are shuffled together and one is placed face down at random. This is the dungeon boss. The 5 remaining monsters are shuffled into the dungeon. The end result should look something like the image below. Players then draw 6 cards from their backpack. The first player is determined randomly. That player’s turn marks the start of the first round. Play passes to the left. Once each player has taken a turn, the round ends. At the end of each round, several game effects take place, as listed later. After setup, players discard down to having maximum 2 cards in their hand. Beyond the obvious changes made to the game, there are several less noticeable changes which should be pointed out. No playing directly from your hand into combat. Maximum hand size is 2. Cards discarded at the end of a player’s turn are placed on the bottom of the store’s inventory instead of given as charity. Anytime a player shuffles their backpack, they should do so under the table to avoid knowing what type of card will be on top while they shuffle. Players can gain levels to go above level 10. This has no effect other than making the player stronger in combat. Players get 5 action points per round. Action points are restored at the beginning of each round and can be used only during their own turn. The only exception to this is Throwing an Item and Casting a Spell, which can both be done on an opponent’s turn. Players who have reached 4th level gain an extra AP per round. Players who have reached 8th level gain another extra AP per round. These Action Points are gain immediately and can be used the turn the player gains that milestone level. If a player uses all of his action points before his turn, he can only take actions that use no AP. Players are highly encouraged to use some sort of tokens to indicate how many action points they have in each round. Equipping – A player takes an item from his hand and places the card in the appropriate slot on his board (equipment, belt or spellbook). Items placed as equipment or on the belt must be placed faceup. Cards places in the spellbook have the option to be placed facedown, but may be placed faceup if the player chooses to have them so (for intimidation purposes, if nothing else). Unequipping – Take an item in play from your equipped items, belt or spellbook and place the card in your hand. Selling an Item – When selling an item players take a card from their hand, reveal it to all players and collect an amount of gold equal to half the card’s cost. This can be represented in any fashion (coins, paper and pencil, tokens, etc). The sold card is placed on the bottom of the store’s inventory. Any card without a cost can be sold for 200 gold. Cards can not be sold to gain a level. Take a Peek – Look at the top card of your backpack. Then put it back. Fighting a Revealed Dungeon Boss – It takes no action points to challenge the dungeon boss if it has already been revealed. Using a Go Up A Level Card – The player reveals a Go Up A Level card, then shuffles it into the store inventory. Stuff an Item – Take any number of cards from your hand and shuffle them into your backpack. Place an Item – Place one card from your hand on top of your backpack. Throwing an Item/Casting a Spell – The player uses one of the items on his belt or in his spellbook, usually to affect combat one way or another. The used card is placed in the player’s discard pile. Players can take this action during other player’s turns, but only if they have the required action points. Buying an Item – A player may spend his accumulated gold to buy an item from the store. When an item is purchased, the player has the option to equip the item immediately (if he has a slot available to do so) or to place it on top of his backpack. The store’s empty slot remains empty until the end of the round, when it is replaced with a new card from the top of the store inventory. Items without a gold cost can be purchased for 400 gold. Frantic Searching – Shuffle your backpack and then draw 1 card from it. Gift Basket – Pay 300 gold to shuffle the store inventory, then place the top card on top of your backpack, without looking at it. Trapping the Boss – Players may put curses or monster enhancers on an unrevealed dungeon boss. These cards may be placed face down on the boss at the time they are cast. Once the dungeon boss is revealed, these curses affect the one who revealed him, then are discarded as normal. The monster enhancers then attach to the dungeon boss. Once the dungeon boss is revealed, players can still trap it, but must do so by placing the spells face up on the boss. Careful Searching – Draw 3 cards from your backpack. Choose 1 and put it in your hand. Shuffle the remaining two and the rest of your backpack together. Looking For Trouble – A player can play a monster card from their hand and fight it as normal. Open a Door – The player draws a card from the dungeon face up, revealing it to all players. If it is a monster, the player must fight it or run away. If it is a curse, the player is affected by it. Reveal/Fight the Dungeon Boss – A level 10 player may reveal or fight the Dungeon Boss. Details for revealing or fighting the Dungeon Boss are listed below. Recycle – Shuffle your discard pile into your backpack and draw a card. Retrain – Choose a new High stat, Medium stat and Low Stat. The effects of these changes do not take place until the end of the round. Polymorph the Dungeon Boss – The Dungeon Boss can only by polymorph if it has been revealed. The player takes the current Dungeon Boss, as well as any monster enhancers and permanent effects on it and shuffles them all into the Dungeon. Then flips the top cards of the dungeon until a monster card is revealed. This monster is the new dungeon boss and works as though it had just been revealed as normal, although the current player does not get to fight it when it is revealed. At the end of each round, the store gets new items in stock. Roll a die and from the side closes to the store inventory, count across, taking the card which is chosen, shuffling it into the inventory and replacing it with the top card. Because the old card is shuffled into the inventory before a new card is chosen, it is possible to pick the same card. Do this twice at the end of each round. When getting new inventory, if a card was purchased this turn, roll for new inventory first, rerolling on any sold cards (empty slots) then replace sold inventory after. Each player goes back to having 5 action points, unless his Intellect or level would force him otherwise. The player sitting to the left of the player who currently started the round now begins the next round. Thus the player who went second in the previous round will go first in the upcoming round and the player who went first in the previous round will go last in the upcoming round. When defeating a monster, players don’t get treasure. They get gold instead. For each treasure a monster is worth, a player gains 200 gold. Levels are gained as normal. Players are able to use the Throw Item and Cast Spell actions during other player’s combats. Typically this is done to make the combat more difficult for the player, but not always. Players are allowed to ask for help from other players. This works just like it does in Munchkin proper. However, with no treasures to pull, players will have to decide how to split the gold, rather than split the treasures. Whenever a player dies, the player’s 3 most expensive items are placed on top of the store inventory pile. The remaining items are dealt to the remaining, living players. Starting with the player to the dead player’s left, each player picks a card from either the dead player’s equipment, belt, or spellbook. Each living player only loots one card from the dead player. At the end of the round, the dead player shuffles his discard and backpack together then draws 4 new cards, playing whatever he wants to immediately, even if it’s not his turn. His next turn is played normally. Death functions otherwise the same as in normal Munchkin. Once a player reaches level 10, they are able to open the door to the dungeon boss. The first player wishing to fight the Dungeon Boss is the one to reveal it. When the Dungeon Boss is revealed, any traps or curses cast on it affect the player who revealed the Dungeon Boss and any monster enhancers affect the Dungeon Boss. If one of the effects causes the player to no longer be level 10, they are still able to fight the Dungeon Boss, but will have to become level 10 again before they could make another attempt, if required. The Dungeon boss functions exactly as stated on the card, however the monster becomes level 20 and its “Bad Stuff” becomes the player dies in addition to whatever other Bad Stuff it has. Once a dungeon boss is revealed, it does not change unless a player polymorphs it. A dungeon boss can not be persuaded to let players by, can not be poofed away, nor can it be plot deviced or made to go to lunch or anything else to be gotten rid of. Once a dungeon boss is revealed, no game effect can get rid of it, short of killing it. Additionally, each time the dungeon boss kills a player, the dungeon boss goes up 2 levels permanently. If the players successfully run away, the Dungeon Boss does not gain levels. While the dungeon boss is revealed, players can still fight other monsters by opening other rooms and dealing with the rooms as normal. Any monster enhancers places on the dungeon boss are not removed after combat. This has the potential to make the dungeon boss very difficult. If the players decide the Dungeon Boss has gotten out of hand, they will have to resort to polymorphing it. However, deciding who has to do the polymorphing can be just as difficult as killing an overpowered Dungeon Boss. The game ends when the dungeon boss is defeated. If a single player defeated the dungeon boss alone, that player wins. If another player assisted in the combat, those players win. The victory must be accompanied by a handshake. Only upon completion of the handshake have both players won the game. However, if either player shouts “Backstab!” before the handshake is completed, that player wins and the other player loses. Double However, if both players shout “Backstab!” at the same time, they both stab each other at the same time. Both players lose. Action Point / AP – Each action a player wishes to take requires a certain amount of Action Points to be able to perform. Typically, players have 5 Action Points each round. Backpack – The pile of cards from which each player draws. Each player has their own Backpack. Dungeon Boss – The monster the players must defeat in order for someone to win. The Dungeon Boss is always base level 20, even if the actual monster card states otherwise. Any monster enhancers placed on the Dungeon Boss remain even after the combat is over. Grenade – Any one-time use card which grants a numerical bonus to a die roll. Round – A cycle of each player taking a one turn. Some game effects happen at the end of each round. The player who takes his turn first in each round moves left each round. Stat – A player’s Strength, Agility or Intellect. High Strength – A player who has a High Strength stat is given bonuses when he uses weapons. For each hand he uses in combat, he gets a +1 bonus. For example, if he uses 1 weapon which uses 1 hand, he gets +1. If he uses 1 weapon that uses 2 hands, he gets +2. If he uses 2 weapons, each using 1 hand, he gets +2. Additionally, he is granted an additional hand slot to use for whatever he’d like. Similar to the Cheat card, he is allowed to use a 2 hand weapon and a 1 hand weapon together. This would give him +3 from his High Strength. Medium Strength – A player with Medium Strength begins the game with 1 level more than he would normally have. Typically, this will start a player with Medium Strength at level 2. However, for example, a player with Medium Strength who was also a Cyborg from Star Munchkin (whose minimum level is 2), would have a minimum level of 3. Low Strength – A player with Low Strength has his maximum hand size (how many cards he can hold in his actual hands) reduces by 1. This has no effect on how many weapons his character can use at any one time. High Agility – Any grenade a player with High Agility uses has any bonuses granted by it doubled. Therefore a grenade which grants +4 to either side, instead grants +8 when used by a player with High Agility. If, for whatever reason, a player does not wish to have double the bonus from his grenades, he can have them function with their normal bonus. Additionally, a player with High Agility has 2 extra belt slots, which can be used to hold more grenades. Medium Agility – All players without Medium Agility must place their grenade cards face up when equipping them to their belt. However, players who do have Medium Agility can equip them face down. This allowed the player more secrecy in what they are able to throw into the combat. Additionally, since there’d be no way to prevent it anyway, players with Medium Agility are allowed to place any item card they’d like on their belt, so long as they at least pretend it’s a grenade. Low Agility – A player with Low Agility has a -1 penalty to any attempt to Run Away. High Intellect – A player with High Intellect is granted an additional Action Point each round, totaling 6 normally at low levels. Additionally, they are granted 2 extra Spellbook slots to use for any curses, traps or monster enhancers. Medium Intellect – A player with Medium Intellect can spend 1000 gold at any point when he would be able to buy from the store to go up a level. He can not use this ability to go to level 10. Low Intellect – A player with Low Intellect has 1 less Action Point per round, totaling 4 normally, at lower levels. MUNCHKIN RAGE!!! – This special ability is activated any time the High Strength Munchkin is in combat for whatever reason. Activating this ability adds a +30 bonus to the Munchkin’s combat score. However, this tires the Munchkin. In his next combat, that Munchkin’s level is considered to be -5. Any other modifiers (such as weapons, grenades, etc…) apply normally. Bait n’ Switch – This special ability can be used anytime a Munchkin with High Agility is in combat as the main combatant. This ability can’t be used if the Munchkin is helping another player. The Munchkin (known here as The Jerk) leaves combat (as if he successfully run away) and another Munchkin of his choice (known here as The Sucker) takes his place in the combat. The Sucker must deal with the monster as if the door had just been opened on him. Combat continues as normal. If The Sucker also has High Agility, he can also use Bait n’ Switch on another player, but not The Jerk, nor any other player who has used this ability during this combat. After this combat (but not if The Sucker uses Bait n’ Switch to switch with someone else), The Sucker can spring open a door on The Jerk. At any point during a combat where the Jerk is the main combatant, the Sucker may call revenge. Combat pauses and the Sucker may flip over cards from the top of the Dungeon deck until he reveals a monster or play one from his hand. The monster revealed immediately joins combat against the Jerk (as if Wandering Monster had been played). The Sucker may only do this once. Hidden Agenda – At any time, a Munchkin with High Intellect (known here as The Illusionist) may play a spell (monster enhancer, curse, trap, etc) face down on a player or monster (as appropriate). He announces to the affected Munchkin (either the Munchkin being cursed or the Munchkin in combat with the monster being enhanced and known here as The Sap) what his spell’s affect is. The Illusionist is encouraged to lie when announcing his spell’s effect. The Illusionist is not required and is, in fact, not allowed to say the actual name of the spell on the card, only the effect is has. The Munchkin being affected can either accept his fate and have the spell effect him has The Illusionist claims it does, or The Sap can challenge The Illusionist and flip the card over and takes that effect instead, better or worse. If The Sap accepts the spell as it was claimed, The Illusionist takes the card cast face down and shuffles it into his discard pile. The Illusionist can use this ability to cast a spell on himself or any monster with which he is in combat, however any player may challenge the spell being cast. This ability can not be used while Trapping the Dungeon Boss. Packing Your Bag – For a more intense game, The players are to choose which cards are in their backpacks at the start of the game. 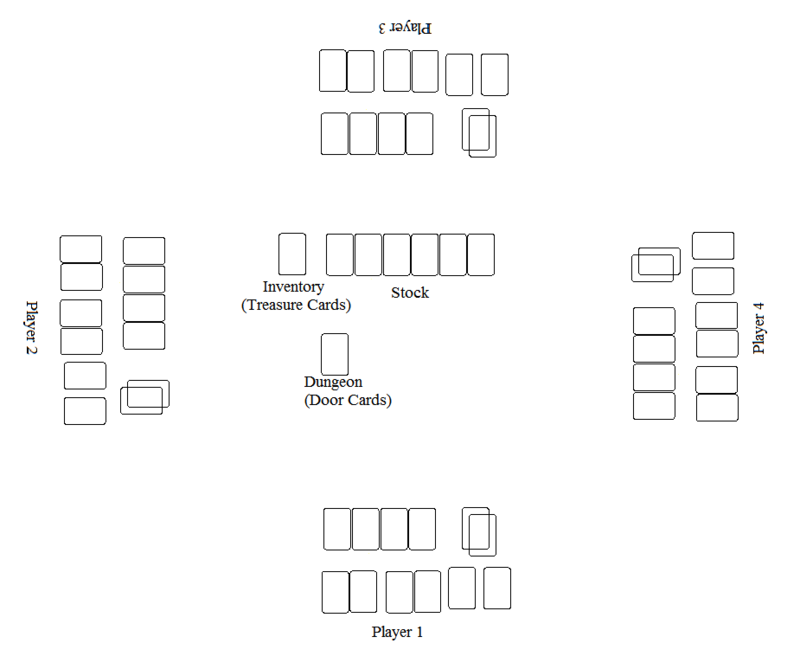 Choose one player randomly to choose first, then go in order, each player choosing 4 cards of either door or treasure or any combination of the two, until each player has 40 cards. The Real Golden Rule – Once a player has defeated the dungeon boss, all players count their gold and total cost of equipped items, items on their belt and in their hand and counts each spell as 200 gold. Whoever has the highest total cost wins. He might not be the one who defeated the dungeon boss, but he’s richer than everyone else. And isn’t that what REALLY matters? In the event of a tie, whoever declares being the winner first, wins the game. Bigger and Scarier (Probably) – Players begin the set up by specifically choosing the dungeon boss. This should be agreed upon by all players prior to game start. Last Man Standing – Once the dungeon boss is defeated, the real victor is the one who tells the king of the great victory. As soon as the dungeon boss is defeated, the players all turn against each other and begin fighting one another. A new round begins (shifting the starting player to the left as normal) then each player, on their turn, rather than open a door, can spend 1 AP to attack another player. Combat begins between those two players as normal. Other players can jump in on either side to aid one of the combatants. During this point of the game monster enhancers can be used on players (yourself included) and will remain on that player until they are defeated. After the combat resolves, the next player alive takes his turn. This cycle continues as normal until one player survives. This hasn’t been play tested yet, but I’m hoping to get it out there. I’ll be in an opportunity to test it pretty soon, I think. The idea here was to give Munchkin a little more structure. I do enjoy Munchkin a lot for the comedy and general play style, but as anyone who has played Munchkin knows, it’s a good way to make enemies out of friends. In normal Munchkin it was too easy to screw your opponents and steal victory for yourself. It was basically assumed the first person to reach level 9 wasn’t going to win, but the second person who did, had a much better chance, assuming the rest of the players were out of cards to use. My hope is by limiting the amount of cards players can work with and by limiting the amount of actions they can do each round, it will add a little more balance to the game. By not allowing players to throw everything they have at each other without limitation, it will require players to think a little more. On top of that, by requiring players to equip grenades and spells before they can be used, the other players have a bit more of an idea of what they are up against. This will make the disappointment of losing a battle slightly less so. Typically, it’s not the losing which bothers people, it’s the not knowing it was coming. Additionally, I’m adding a bit of customization to the game. As I’ve stated previously, I’m a fan of customization. It’s not a lot, but by giving the players the chance to choose stats, it will make each player less totally reliant on luck-of-the-draw equipment. In that same vein, the gold system allows players to stray further away from the luck over skill (which I’ve also gone over before). The store allows each player equal opportunity to some of the equipment and everyone has a fair shot at it. But in not getting rid of luck completely, players are still given a random grab-bag of equipment to start with. Further, the system wherein the starting player in a round changes each time further pushes a balanced game. Lastly, the Dungeon Boss idea was something I thought would be interesting. The main idea came from Munchkin Quest, but with the added level that monster enhancers stay on the Boss, by adding them, you are only making it harder for yourself to win as well. So the idea of throwing everything you have at the Boss might not be the best tactic. As I’ve said, I was really trying to make Munchkin a more balanced game. Less reliant on chance, which it was solely before. Munchkin has some great cards, humorous ideas and would be great to play everyday if it wasn’t so frustrating to lose. 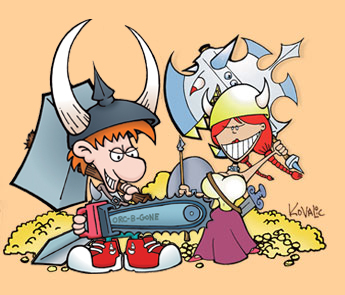 The hope is that by giving players options, having every player access to the same cards and by limiting how much you can screw over your opponents at any given time, Munchkin will evolve into a much more balanced, friendly game which won’t make people want to kill each other (outside of the game, at least). This entry was posted in actions, alternate, munchkin, new, revamp, rpg, stats, variant. Bookmark the permalink.